Background. The Minnesota Naval Militia has its origins in the Spanish American War (April-August, 1898). 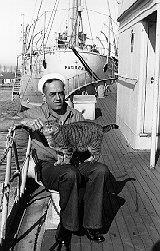 Many local men had served with the U.S. Navy during the war. After the war, a number of these Navy veterans sought to create a Minnesota Naval Militia based in Duluth. Capt. Guy A. Eaton, a native of the Duluth area, was one of them. He is often referred to as "the father of the Minnesota Naval Militia." 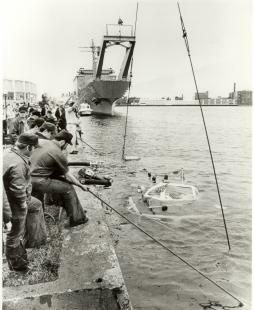 In 1899, the state established a naval reserve, and in the late 1890s, Capt. Eaton wrote letters to the federal government to establish an official naval militia base in Duluth, the first in the state. Along with Eaton, two other men, Seaman Clarence Tuttle and Quartermaster Fred Engels, founded the militia. After months of groundwork preparation, permission was secured from the State Department and the War Department, and in 1903 a unit of two divisions was organized. Capt. Eaton was the first commander of the state naval militia. Congress passed a bill recognizing a federal role in training and equipping the various state naval militias. In 1905, the state legislature officially redesignated the naval reserve as the Minnesota Naval Militia. Eaton pressed on with his vision for a fully trained militia and in 1906 was permitted to bring a ship, the U.S.S. Gopher, to Duluth, for training purposes. Originally named the U.S.S. Fern, the ship's name changed with its new assignment in Minnesota. With the arrival of the Gopher, a full training program was finally underway for the Minnesota Naval Militia. In 1906, a boathouse and pier were built near the yacht basin on the harbor side of Park Point. This provided a meeting place, workshop, and lounge space for the militia. In 1911, the militia used the Gopher to bring firefighters and supplies to fight a forest fire near Grand Marais, Minnesota. On November 22, 1915, the National Guard Armory was opened in Duluth. Opening festivities included a grand ball and a visit by Gov. W. B. Hammond and other state officials. The armory was built to accommodate both the Minnesota Naval Militia divisions and the Army National Guard companies. The 65-room armory was designed to allow each unit its own section of the building. It included a drill floor, a large space dedicated to training, and a gym. In 1915-16, the U.S. Naval Reserve, a federal branch of service, entered Duluth. World War I. The Minnesota Naval Militia trained men during World War I and had chapters in Bemidji, Crosby, Duluth, and Pine City. In 1917, under the command of Capt. Eaton, the militia traveled south to Philadelphia. There Capt. Eaton assumed command of the U.S.S. Massachusetts and later the U.S.S. Iowa. Members of the militia were assigned to different Navy crews, including the Massachusetts, to serve in the war. 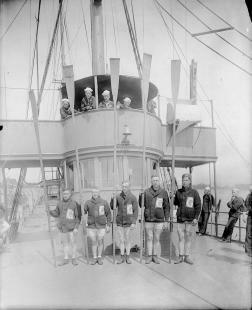 After World War I, local training continued. In 1921, the Gopher was sent to the Atlantic coast. 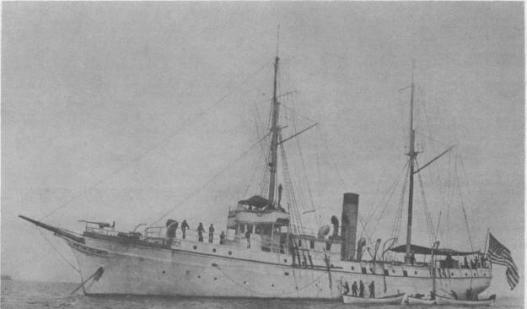 In 1922, the gunboat cruiser U.S.S. 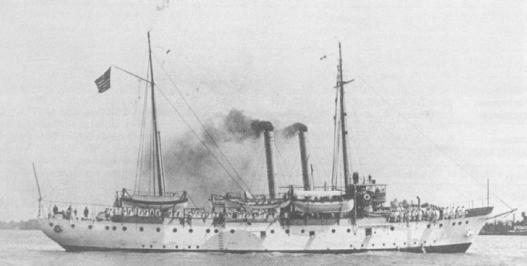 Paducah was assigned to Duluth. 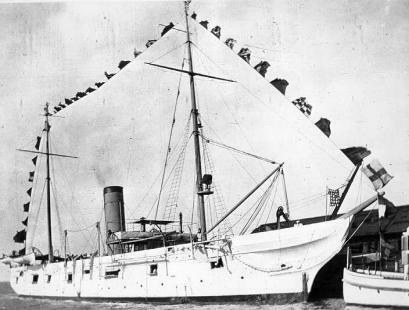 It was used as a training ship until 1940. In 1927, the U.S.S. 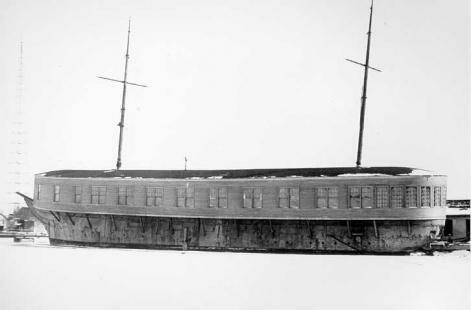 Essex--the oldest steam cruiser in the U.S. Navy--was brought to Duluth and used as a receiving ship. (Built in 1874, its construction had been authorized by Abraham Lincoln.) It was stationed alongside the Paducah. In October 1930, the Essex was stricken from the Navy list, and a year later, it was brought to the lake side of Park Point and burned to the waterline. Its underwater remains are still visible 5 feet from the shore. It is a protected historic site and is listed on the National Registry of Historic Places. In 1932, the Duluth Naval Reserve finally was able to attain updated training. Recruits were now under the authority of U.S. Navy officers. Members were able to practice maneuvers such as gunway exercises, target practice, and target control of guns. In 1936, the YP-61 replaced the Essex. The YP-61 had originally been the Coast Guard patrol boat Dallas. Preparing for WWII. On December 3, 1940, the naval reservists in Duluth were activated, fully a year before the U.S. had entered World War II. They boarded the Paducah and the YP-61 at the Port of Duluth and landed in New York, where they were assigned to various U.S. Naval units that served during World War II. Developments after the War. After World War II, the Minnesota Naval Militia as such was no more; the U.S. Naval Reserve had taken it over. In 1946, discussions were held concerning new reserve units. Each unit would contain approximately 200 men and thirteen officers. This organization of the Ready Reserve Battalion was activated July 23, 1946. Commander J. S. Kapuscinski required that all those serving have some previous military experience. Thus, the Duluth Naval Reserve was reconstituted. Members of the Duluth Naval Reserve served in every major conflict since WWI, including WWII, Vietnam, Korea, Bosnia, Somalia, Desert Storm/Shield, Iraqi Freedom, and in Iraq and Afghanistan. 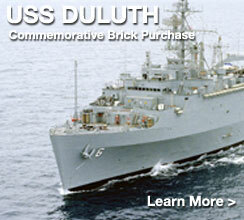 In 2005, the Duluth Naval Reserve was put on the B.R.A.C. (Base Realignment and Closure) list. In September 2007, the Duluth Naval Reserve Center was closed. By the end of 2007, drilling reservists were reporting to Minneapolis rather than Duluth for training, and active duty personnel were transferred from Duluth with normal orders. The Duluth Naval Reserve and Militia has left a lasting legacy, and the service of its members will be remembered.